ION Orchard has lined up exclusive gastronomic treats from now until 31 July for shoppers to enjoy. 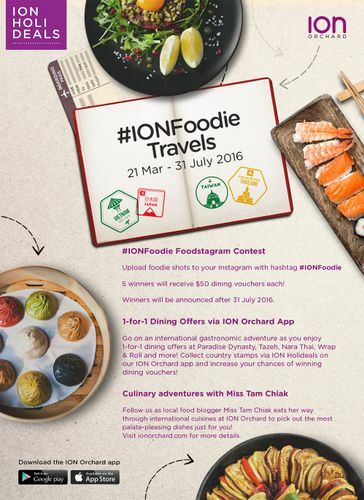 The treats include the #IONFoodie Foodstagram contest, as well as 1-for-1 deals through the ION Orchard app. Shoppers can also follow the culinary journey of local food blogger, Miss Tam Chiak as she explores ION Orchard’s treasure trove of dining options. These days, capturing Instagram-worthy photos of delicious culinary finds is a common sight at almost every dining table. Even better, with the #IONFoodie Foodstagram Contest, shoppers get to take their best shots for a chance to win $50 dining vouchers doing what they love – taking photos of their food! All they have to do is take a photo of any food item purchased from any participating F&B store in ION Orchard, and upload it to Instagram with the hashtag #IONFoodie. Five lucky winners with the best photos will each win $50 dining vouchers. Shoppers can also follow famous local foodie, Maureen Ow of misstamchiak.com, who will be eating her way through ION Orchard to discover the most palate-pleasing dishes for shoppers to savour. Travel the world and bring out your inner gourmet with ION Orchard’s #IONFoodie 1-for-1 deals and relish tantalising cuisines from various places such as Japan, Vietnam, Thailand and Hong Kong. Shoppers can opt for tantalising Korobuta pork dishes from Tonkatsu Ginza Bairin, to tasty international chicken kebab wraps from Tazeh by Shabestan or a comforting bowl of Wrap & Roll’s piping hot pho chicken noodle – there is something for even the most discerning taste buds. And with the ION Orchard app, all they have to do is collect country stamps via ION Holideals and increase their chances of winning dining vouchers.